My husband, Timmy and 4 children. Our three boys, Phoenix (7), Sky (5) and Tala (3) and our baby girl, Coda (1). Where are you from and how did you end up in Byron Bay? I’m from Boston, USA. I studied in Australia for a year of university in 1999 and then traveled extensively for the next 8 years, using Australia as my base. I kept passing through Byron Bay and every time I did, it called to my heart. In 2008, restless and feeling homeless, I got off a sailing yacht in Cairns and took a bus directly to Byron, got a job and met my husband within 2 months of being here. It’s been home since then. Please tell us more about living on a bus! How did that come to be? We owned a house in Byron and after having our third boy, I began to feel incredibly caged in living in a townhouse with a tiny yard. 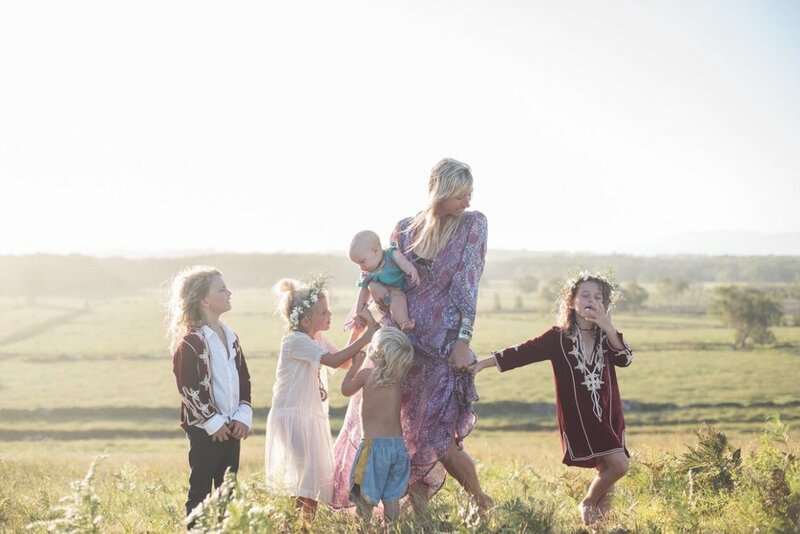 I grew up on a large property, and wanted to raise my children close to the earth and with open space for them to be wild. We bought 11 acres in the Byron Hills, there was no house on the land only a simple 6m x 6m shed. We chose not to sell our Byron place, so we couldn’t afford to build a new house on the property…instead we bought a 1970's bus which we used as a bedroom (king and queen sized beds put together in an epic co-sleeping arrangement). We used the properties existing shed to cook in, hang out and put in an outside shower and composting toilet. We spent 3 years happily living like this, spending almost all our time outdoors. A few months ago, we recycled a beautiful 2 bedroom handmade house out of Byron, so now we have a bit more indoor space. But the bigger boys still sleep in the bus. How do you maintain privacy for yourself and as a couple? We own a restaurant so my husband works late cooking. I tend to lie down with my kids in the bus to get them to sleep, jump on my emails, and do some work and then get up when he gets home from work. We then catch up on our days, have a drink together and enjoy a few moments to ourselves. What helps you balance designing for Chasing Unicorns, being a mom, a partner, and having time to yourself? Very awkwardly!! Chasing Unicorns took off so fast, I feel like I spent the last 12 months chasing myself! I feel so happy and fulfilled in my work, but also definitely feeling a bit out of balance!! I just try to stay in the moment and on the task at hand. If I’m with my kids, I try to focus on that. I do get to do work while they all run wild at home, so that’s a major plus of having open space. I go for a quick run almost every morning and this is pretty much my sanity saver. It makes my head calm, allows me to get organized for my day, and keeps my moods level. If I don’t, I get overwhelmed and struggle with focus. We have become much more kind, forgiving and peaceful in our relationship. We are both very intense and passionate and used to get caught up in the small stuff as you tend to do when it's only the two of you to focus on. Having children put everything into priority and perspective. Our family is bigger than each of us, and it made us much more ready to agree with each other for the greater good! We are busier with less time for each other now more than ever but much much happier together because we are working towards a shared goal for our family. We love taking our horses to the beach or up into the local state forest. We take turns riding while the kids swim or ride their BMXs. If we are at the beach, the boys then take the horses across the street to the Brunswick River and swim with them in the water, diving off their backs like they are rafts! Where do you find inspiration for Chasing Unicorns? I find inspiration in the decades past. I’m a romantic who loves femininity and powerful womanly shape, but not overt sexuality. I am also nostalgic for times when life was simpler and slower. I pour over vintage styles, being drawn to little details like the chevron pleats on the skirt of a 1930's dress or the lattice smocking on the shoulder of a 1940's style. I’m endlessly inspired by details and then incorporate them into the dress shapes in my head. What do day-to-day operations look like for you? Coffee in bed with my husband, a quick run, get my bigger kids ready and to school, head to the office or a photo shoot with the baby and often Tala in tow, then work until they lose it at which time we need to do something fun for them or get them to sleep. Everyone who works at my warehouse is a mother. At current count there are 5 of us with 15 kids between us, so there are always kids in and out, mess everywhere and toys strewn on the floor. Stay authentic and true to yourself and your passions. I think lasting success only comes from authenticity. You need to be honest with yourself about your strengths and weaknesses, your ethics and your passions. There are enough people in the world for you to build your business on your truths and then find the like-minded people who you resonate with. Be kind to yourself. It’s such a massive life transition and there is always so much to adjust to and to try to find balance with: yourself as a woman, as a mother, as a partner!! Don’t put too much pressure on yourself to do everything perfectly. Just do what feels right and remember that even when things feel overwhelming in new motherhood, it only gets easier! What are the most essential things to you as a parent? To always make sure my children feel my unconditional love. I love them whether they succeed or fall short, are well behaved or naughty, are great at something or not, and I try and always make this love the foundation of our relationship. This goes both ways. Sometimes I’m too busy and failing a bit in places in my life, but they always know I love them and that’s more important than anything!